Does the idea of WYSIWYG really get your goat? Then BBEdit is the app for you. Its goal is simple: to be the best text-editing program around. But BBEdit makes no compromises for the weak. There are no templates, just code libraries. There's no dragand- drop, no picture resizing by dragging corners - just the biggest collection of tools you could ever hope for if your one aim in life is to produce the best code imaginable. BBEdit's main virtues for the web developer are in its understanding of HTML and CSS syntax and its find-and-replace capabilities. Create a web page and BBEdit will highlight the source correctly, and tell you if there are any mistakes, elements that have been deprecated, character entities that haven't been encoded, or notation shortcuts that shouldn't have been made in that or any other group of pages. When you're writing your page, you can either type it in by hand or get BBEdit to insert the tags you need, clicking boxes and entering data in fields to populate all the necessary attributes in each tag. If you're used to the imprecision of WYSIWYG, it's refreshing to know that every tag has the usability and accessibility requirements necessary from the moment you put it into your page. 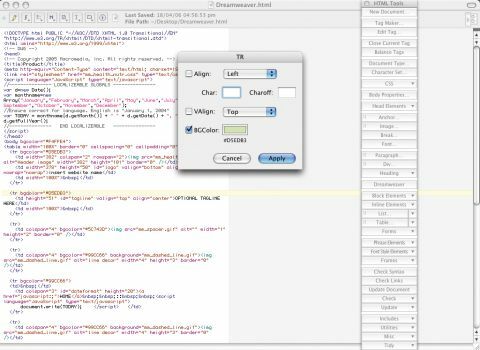 BBEdit is equally adapt at other languages and there are plug-ins available for those it doesn't understand out of the box, making it a tool for programmers and dynamic web page editors as well as regular web designers. It's also more than capable of dealing with files hosted on servers, having its own built-in FTP client.